Are you afraid to tell your story? You know, do you really feel confident talking about what you really want to do for work? It’s perfectly normal! 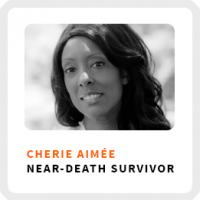 Cherie Aimée wants to help you overcome your fear of sharing your story as she was able to do. She’s the brand ambassador for NY Presbyterian and Columbia University Medical Center, the hospital that saved her life after being clinically dead for 90 minutes! She also helps people develop their personal brand around their core story. Believe it or not, Cherie says she first felt ashamed to share the story she’s about to share with you about her miraculous recovery! I mean she was clinically dead for 90 minutes, was on a bionic heart for 5 years and is only recently is recovering from her heart transplant. Her story is unbelievable! Needless to say, this experience forever changed her understanding of herself. And she wants you to know that you don’t have to go through a near-death experience like she did to transform your life into the person you’ve always known you’ve been. How she overcame the shame of sharing the story of her near-death experience. Why the ultimate freedom is the freedom to be your true self. Letting your tribe by drawn to your voice, instead of trying to fit your voice into a tribe. Wake up time: Around 5:00 am, starting the day with quiet time activities. Core work activities + habits: 1) Making phone calls, connecting with people. 2) Engaging with social media and her tribe. 3) Writing for her own site, other sites, or her own sanity. 90-day goal: Build her speaking platform, finish her book on near-death experiences, and make more in-person connections with people through retreats. 1) Schedule quiet time in your day. Just take time to listen to yourself. She prefers being near a body of water as she self-reflects because she believes it helps quiet her mind. 2) Writing and journaling. Give the things in your heart and mind some motion.